Everybody does it, so what’s the problem? You’re right. The National Highway Traffic Safety Administration says more than 70 percent of young drivers say they have texted while driving. Worse yet, the National Safety Council says 47 percent of drivers are actually “comfortable” texting and driving. Considering that the reaction time of a driver using a cell phone is actually slower than the reaction time of a legally drunk driver with a .08 blood alcohol level, these statistics are frightening. Every text, glance at navigation or interaction with an audio touch screen means tons of metal are moving at deadly speeds without any guidance. Perhaps that’s part of the reason why driving-related deaths continue to increase. New technologies and distracted driving also affect your insurance costs. In addition to increased claims from increased incidences, high-tech cars cost more to repair. Get rear-ended by a texting driver and you need to repair more than your bumper and tail lights. Many cars now have rear-view cameras and back up sensors, kick-activated tailgate openers and more. Costlier repairs mean costlier premiums. Turn off your phone or place it face down while driving. Use an app that will send automated messages stating that you are unavailable to those who call or text you while you are driving. If you need to use mapping services, use a phone mount or cradle so you can keep both hands on the wheel and see your phone at the same time with minimal time for eyes off the road. Do not talk on your cell phone while driving. If a call needs to be made, safely pull off the road and have your conversation while you are parked. Never operate your phone manually while driving. Simply put down your phone and drive. 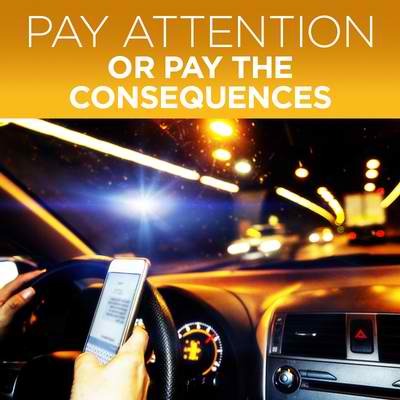 Common sense, patience and a realization of what’s at risk can go a long way in reducing the cost, injuries and deaths from distracted driving. Won’t you do your part?